Thank you for all the baby well-wishes…we are adjusting well and even managing to sleep well at night…imagine that! Luckily I finished up this quilt just before she was born. I backed it with a minkee fabric I bought locally. It has a really nice weight to it and is super soft (by Shannon Fabrics). I quilted it with minimal straight lines here and there to keep it from being too stiff. The quilt matches her perfectly…I can’t get enough of all the pink! the quilt was already perfect. the baby just made it perfect-er. That's right She's a beautiful baby with a cute pink quilt! She's one lucky baby! Congratulations! So sweet and beautiful. I can just smell that "baby" smell as I recall when ours were born. Love the quilt also. She's beautiful and so is the quilt! Both are quite precious indeed! Enjoy! what a sweet little quilt for such a sweet little baby girl. Look at all that hair! Reminds me of my second when she was born. Congrats! She's beautiful! All that hair! Such a pretty quilt too. I know what you mean about the pink. Beautiful quilt and simply gorgeous baby girl! The quilt and the tiny gal are both perfect!!! :) Congrats! So sweet….and sleep too! What a perfect baby…. Preciosas las dos, la niña y la mantita. Enhorabuena!!! Best quilt picture maybe ever! What a little bundle of love! So Pretty! I love all her hair! this is a perfect quilt! Gorgeous! The baby and the quilt. Congrats and oh such sweetness!! So very sweet! That quilt is pretty cute too. Have fun with your girlie. Baby and quilt are adorable! Congratulations on your beautiful new baby, we have one too (1st grandson), born on March 6th and soon to be 2 weeks old. The quilt you made for her is perfect. She looks lovely in pink! So,so cute! I think that this is about the cutest little person I have ever seen – congratulations. Two gorgeous pink creations! Aren't you clever! Congratulations Mummy. They're both as sweet as can be! Congratulations…they are both so sweet! Sophie is so cute! Love your baby quilt too. Thanks for your tip about making the hour-glass blocks, much easier and faster. I'll bet you can't stop smelling your sweet little baby, babies smell so good. Congratulations! She is beautiful and what a lovely quilt! Beautiful quilt for a beautiful baby !! Ah, I remember those days! My sweet baby girl is 22 now. :) enjoy! She is a cutie pie, and the quilt is wonderful. These pictures are so sweet! I love the quilt but I loved the baby more. I can't get over all her beautiful hair! Congratulations on your new little Sophie (love the name too!). She looks perfect snuggled on the quilt that her Mommy made her. Hugs to the big brothers too. 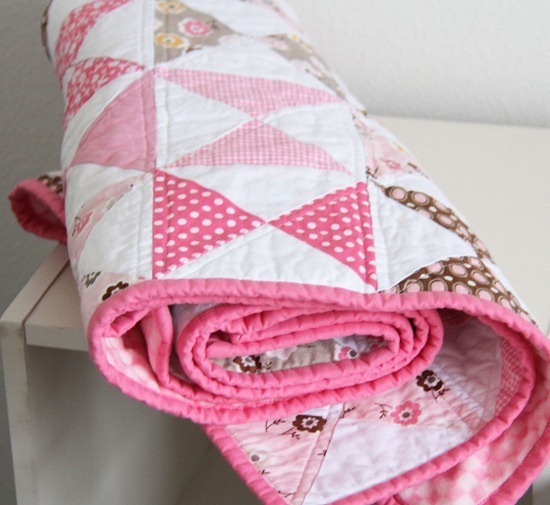 Now you can make her tons of pink quilts. She is presh! And stop it, you're making fall for pink…maybe its the baby? Such a sweet baby! And the quilt is an added bonus. Congrats! A beautiful quilt for such a beautiful baby girl. She is adorable! So is the quilt. And I really like her jammies too. Congrats to you. as a mom of 4 boys (all grown) my heart is melting seeing all this pink! Oh so cute. Wife and I are sitting here wondering when Julia will come join us. Congrats on the wonderful baby. 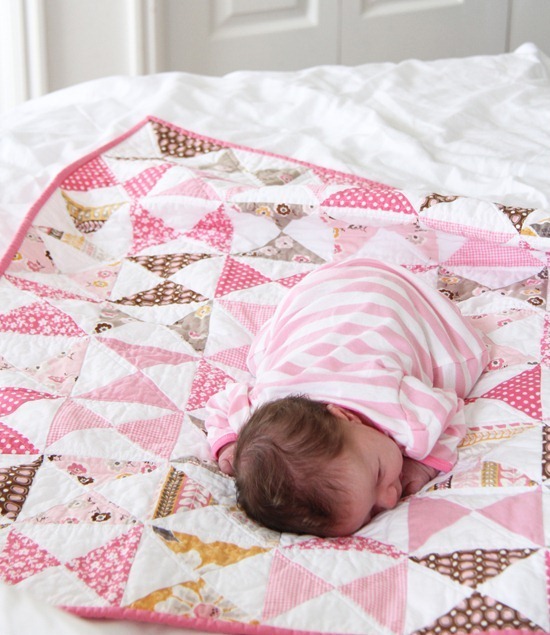 Your pink quilt is gorgeous, but not as gorgeous as your baby!!! Wow, Allison, she's darling! I'm so touched by the babe and the quilt! Thanks for sharing her with us. OH MY GOSH! Sooo adorable! I just want to snuggle with that precious baby girl. You are so very blessed! Your quilt and your precious little girl are absolutely beautiful!! Congratulations!! Sorry this is late but congratulations on a beautiful little girl. Oh she is just lovely. And what a nice head full of hair she has. Did you mention a quilt? LOL. You know that baby girl stole the show! sweet quilt, but sweeter baby! Blessings to you all! Congratulations! She is precious and her quilt so sweet! Congratulations, and kiss that sweet little pink bundle for me!!!!! Such a picture of perfection. Congratulations. She is such a little sweetie and the quilt is sweet too. Almost five years ago I had my girl after two boys (one is named Ryan LOL). There is not a single day that goes by where I don't revel in the pink girliness and love on my sweet baby princess. I am so happy for you! Your boys will treat her like a queen and she will bring such sass and joy into your lives. Glad you are getting some sleep! Ohh it's beautiful, very cute and sweet. I like it. Congratulations on your sweet baby girl! I have two girls almost grown now. There's just something about girls…well, until they turn around 13….LOL! Love all that hair! 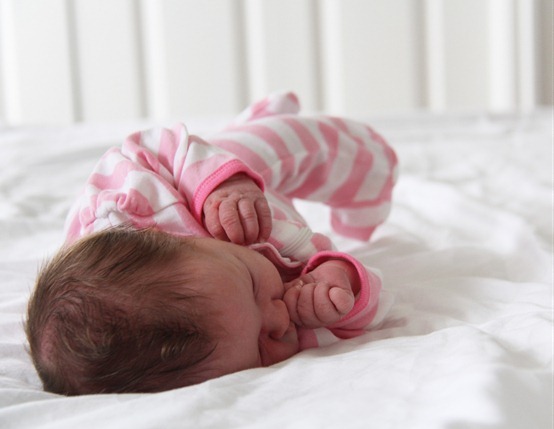 Lovely baby on a lovely quilt :) Thanks for sharing the precious photos (these and from the previous post, too). Both are precious! Thank you for showing us the completed project. Oh gosh. The only thing sweeter than that quilt is the baby on it! This makes my heart melt! So beautiful! 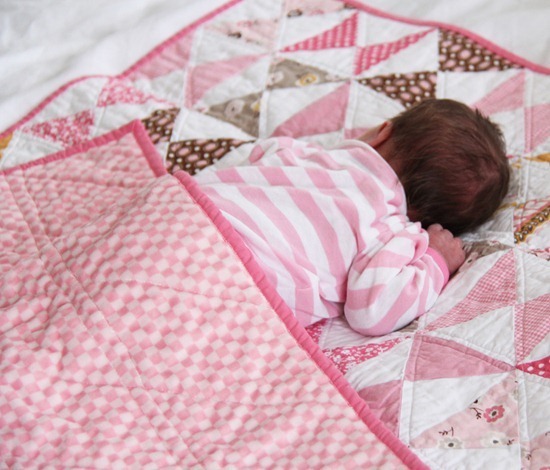 Love the quilt & the pics of Sophie with her new quilt – so sweet! All the best both you, baby and family. Adorable and precious! Sending Congrats and wishes for all good things for you and the family. So, so precious! Congratulations on your little pink bundle! Yay!!! Congratulations! Glad you're getting some sleep. She's darling and so is that quilt. Beautiful, and I like the quilt too! Oh my word, how precious! Congratulations on the birth of Little Sophie! She is absolutely adorable. Wishing you all the best. She is beautiful; I love all the pink you can have with a girl. The quilt is very pretty. She is just beautiful. Your quilt is nice too and I might just copy it. Ok both are gorgeous. Wow, perfect baby on a perfect quilt! I need to go work on the not started baby quilt for the bun currently in my oven right away now. This baby of yours is wrapped in love. Really awesome!!! Hope you are feeling good! Totally made my day to see the amazing and beautiful little One and the darling pink quilt :) What a handsome young man demo-ing that quilt, also! A million congratulations and Blessings to you all! Many congratulations! What a lovely combination – cute baby and a lovely quilt! This has got to be the most perfect picture in the whole world (other than the one I had of my brand new son sleeping 40 years ago). Seriously this picture is absolutely wonderful. She's beautiful baby: congrats!!! and the quilt is such a pretty one!! She is precious and beautiful. What a blessing! The quilt is gorgeous too! Congratulations! Quilt and baby just picture perfect – you are one blessed woman! Oh, sweetness! Congratulations! What a precious baby girl you have. Oh what a sweetheart! Congratulations! Your sweet pink quilt is adorable and your little makes is even more special! Super cute quilt, and even cuter baby. Congrats on your sweet baby!!! She is just beautiful! Congrats! I mentioned this post (and linked it) in my blog post today (March 27), crediting your lovely color choices for the quilt as inspiration for my project materials. I admit it – though I've always peeked at your website daily, lately I find myself coming back more and more often just to take another look at that sweet little baby. (sigh) I remember those days so fondly. Enjoy her! Here is a different way to do the half square triangles with no marking, much faster. Cut your squares and place them right sides together. Sew a 1/4 inch seam all the way around the outside edge in a square then cut from corner to corner then cut the half in two using your ruler to make sure it is even. Try this, I think you will like the method. I followed your pattern for a quilt I made for my baby girl! I’m crediting you (and linking this post) for the pattern of the quilt on my blog! Hope you don’t mind! It turned out adorable no matter what colors you use! Thanks!